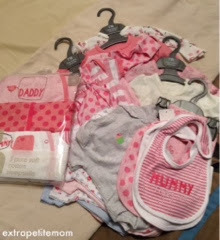 And I recently also bought some more from Mothercare Brunei and ordered online from Marks and Spencer UK! Lol! So yea.. As my mom said, "puas bebaju.." :P Overall spending on baby clothing so far is more than the price of my MK bag. Hehehe.. Overall, I have some in every sizes - early, tiny and newborn clothing. I hope that it'll be enough for the next few months. I can always buy again :P but, I'll restrict to what we need at that time rather than based on hunch. Urmm I also bought dresses for Baby A. already in bigger sizes 3mths. Hehehe.. Couldn't resist them! They're just too cute!